Congressman John Lewis is most likely labeled as a politician. He represents Georgia in the House of Representatives. He’s often on the news weighing in on current political events. But how did he reach the heights of our nation’s governance? What’s his story? If we rewind from Congressman Lewis’ current life in Congress to his earlier years during the 1960s Civil Right Movement in Alabama we will find some more-than-interesting stories. Well, not stories in a fictional sense. Nonfiction stories. True stories. Lewis was a key leader in the Civil Rights Movement, often working alongside Dr. Martin Luther King Jr. and Malcolm X. Lewis is an activist, a legendary leader who fought with his life on the line for the rights of all men and women. Already raking in the awards this past year, March 3 is the third installment in Lewis’ March graphic novel series. Accompanied by Aydin and Powell the rhetoric and the visuals of this true story represent the American spirit of bravery, courage, and humanity for all during one of the most critical humanitarian moments in our nation’s history, the Civil Rights Movement. Plot: Experience one of the 1960s most pivotal Civil Rights Movements, a march from Selma to Montgomery, Alabama. 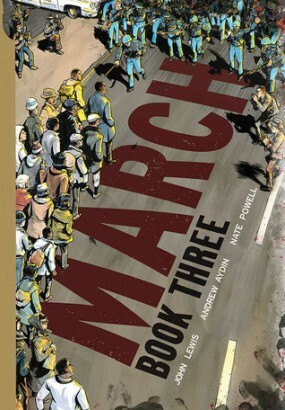 Written by Congressman John Lewis this historical march is now available in graphic novel format for middle and high school readers. * A Common Core Standard for High School is used because March 3 is appropriate for both high school and middle school (both of which are covered in the standard above). Directions: One of the most rewarding experiences while reading March 3 is paying attention to the dates, locations, and growingly-heated-events regarding Lewis’ experiences and involvements during the civil rights movement. For that reason, students would benefit from creating a timeline while reading. As they read, ask students to write above the timeline, noting every single specific date that Lewis includes in the text and a brief description. Below the timeline students can further elaborate on that same event by providing supporting visuals for each event listed above the timeline; in other words, above the timeline will be a date and explanation and below the timeline will be a visual representation of that same event. Students may need larger paper than standard 8.5” x 11” to draw a longer and continuous timeline to represent Lewis’ story.